Every time I see a mini pumpkin, I really want to try turning it into a candle holder. It seems like such a simple project, and this weekend I finally got around to giving it a shot. Turns out I was right! 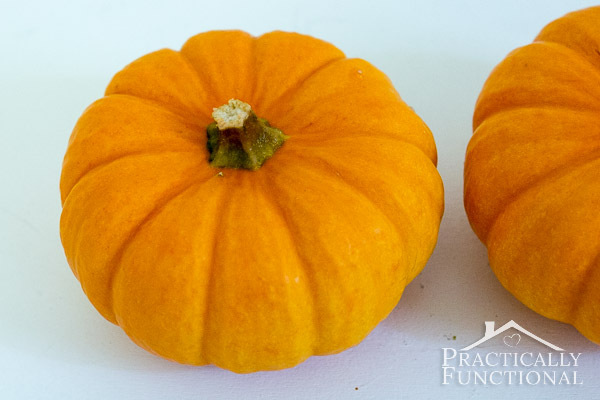 These DIY mini pumpkin candle holders are so simple and only take about five minutes to make. 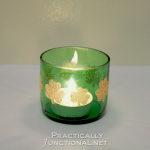 I put gold taper candles in mine, but you can size these candle holders to fit any tea light, votive, or taper candle! Most drill bits have a sharp point at the very end of the bit, but you need something flat for the drill bit to start into. So if the stems on your pumpkins are “natural” instead of trimmed flat, use a box cutter to cut off the end of the stem, parallel with the ground. 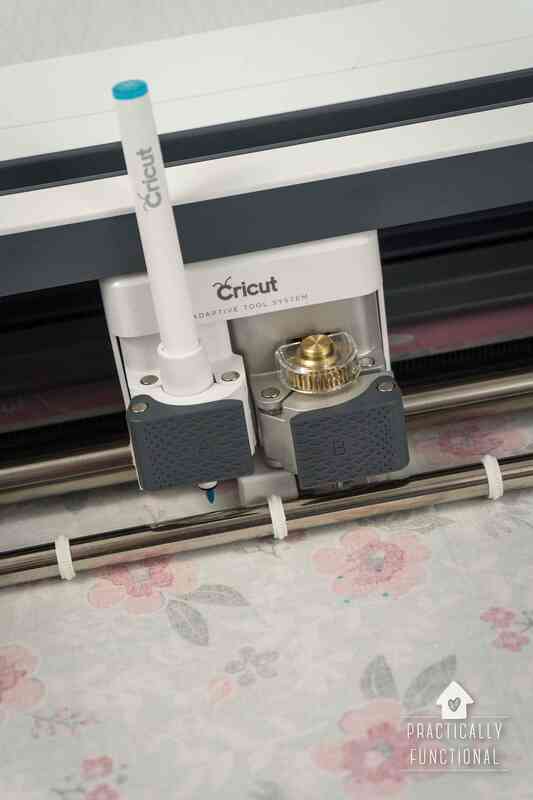 To give the drill a little more stability, you can use the box cutter to gouge out a tiny depression in the stem so that there is a tiny “pilot hole” for the drill bit to center itself on. Now decide which type of candle you want to put in your mini pumpkins. You need to choose a drill bit that is exactly the same size as the base of your candle. I used a 7/8″ spade drill bit for these taper candles, but for a votive or tea light you will probably need something bigger, like a 1-1/2″ bit. 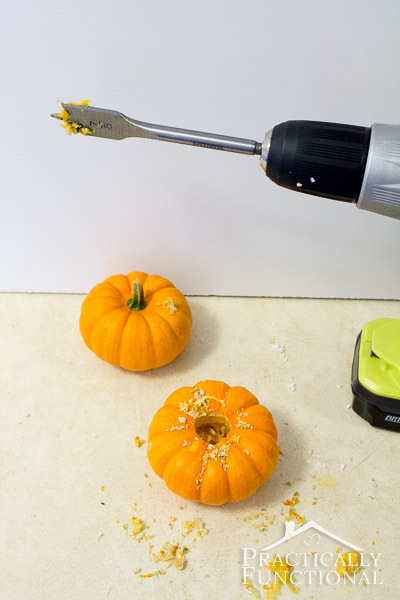 Press the point of the drill bit into the center of the stem of the pumpkin, and slowly start drilling. The drill will have a bit of trouble right where the stem meets the pumpkin. Keep gentle pressure on the drill while it works through the base of the stem, but don’t push too hard because as soon as the drill bit gets into the pumpkin itself it will start to move really quickly and easily. Drill about a 1/2″ to 3/4″ into the pumpkin, but be careful not to go all the way through! Scoop out most of the seeds and flesh from inside the pumpkin, and wipe away any gunk on the outside. If you need your pumpkin to last as long as it possibly can, rub some vaseline on all of the exposed flesh (the entire inside, and the part you drilled through). 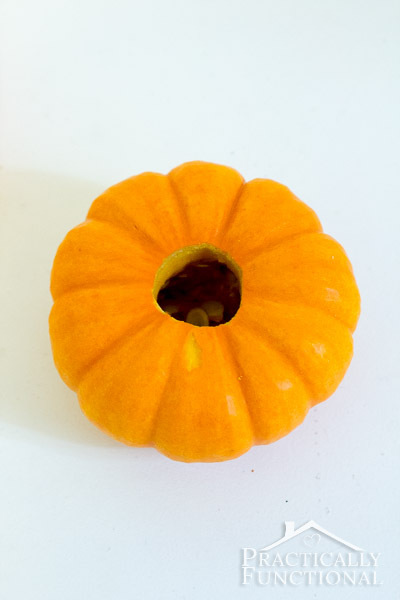 Then add a candle, and you have a fun and festive mini pumpkin candle holder! If the hole is too big and the candle wiggles, just light a candle and let a bit of hot wax drip into the mini pumpkin around the base of the candle. Once the hot wax cools it will hold the candle upright. They’re perfect on my fall mantel! Have you ever decorated with mini pumpkins? I put some mini gourds up on my fall mantel last year, but this is the first time I’ve used mini pumpkins. So cute! « 20 Halloween Crafts & Recipes You Can Make In Under An Hour! 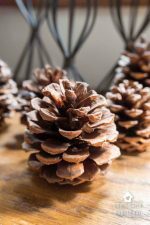 These would be perfect for my Thanksgiving table – pinned! Cute! And so easy. I love those drill bits. Very handy!! super cute jessi! love em! Such a cute way to put those little pumpkins to good use! What a really awesome idea! I love candles and this is a unique way to display them! 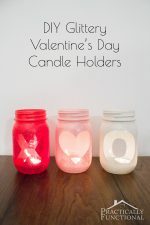 Thanks Kim, I love candles too and this is just such a simple way to do something fun with them! Great, idea! I love it, I’ll pin it NOW! I love these! So creative and chic! 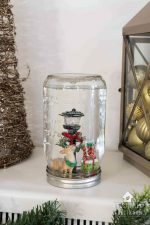 I just want to let you know that I’ve featured these on my Finding Friday: My Favorite Finds post yesterday. 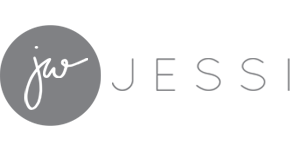 I hope you have a chance to swing by and take a look! very cute! 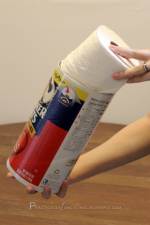 i have one of those drill bits…may have to try this, thanks for the tutorial! Such a fun idea! And so easy! Thanks for linking up at Romance on a dime!! love this, and the colors in this whole vignette. I was staring at my mini pumpkins yesterday thinking of what I can do with them, thanks for the tip –they’re going to make a good addition to my Thanksgiving table. Love the candle holder idea! I’m going to decorate my mini pumpkins with gold paint. Where did you get the metal candle holder to the right of it in your pictures? I have the tealight version but was also looking for the accompanying pieces. I found the little metal pumpkin candle holder on clearance at Michaels!